Info "Get these notebooks and papers in order! Shaking them willy-nilly won’t help matters either!" The Intern is one of Penny's Microgames in WarioWare: Smooth Moves. 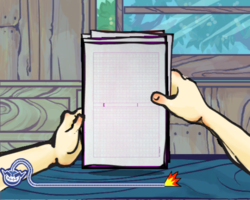 The player has to straighten the stack of papers or books by hitting the Wii Remote against their palm. If it is done too quickly or unevenly, the papers will not straighten. 1st level difficulty: The player has to hit the Wii Remote two times. 2nd level difficulty: The player has to hit the Wii Remote three times. 3rd level difficulty: The player has to hit the Wii Remote four times. This page was last edited on April 19, 2019, at 09:13.